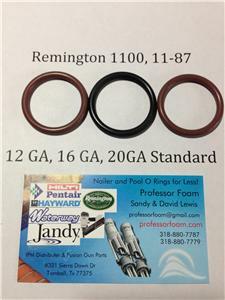 3 new aftermarket Black or Brown Viton Gas O-rings for the Remington 1187 and 1100 12, 16, 20 gauge standard. You will receive 3 O-rings that will fit 12, 16, 20 gauge for $3.20!! Quantity available shows how many sets of 3 are available for sale. I mostly use 1st class mail. Tracking IS NOT provided with 1st class. Delivery Confirmation is not so if you want it please choose parcel post.